Kittens benefit greatly from time spent with mama and litter mates. Separating kittens from their trusted mother cat definitely is not always the easiest experience. After all, the bond between the mother and kittens is a strong one, not to mention the deep connection between litter mates. In general, kittens should remain with comforting, sweet mommy until at least weaning age. It is very important for kittens to remain with mom until weaning is completed. The mother is the sole nutritional source for kittens until they're about 4 weeks of age, although weaning often continues until the cuties are between 8 and 10 weeks, according to the ASPCA. Kittens rely on their mother's milk for proper growth and development. In many cases, kittens begin eating strictly solid foods at around 8 weeks, and then may be ready to leave their mothers for good. 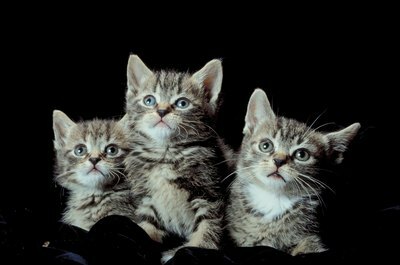 The organization Cats International recommends keeping kittens with their fellow litter mates and mothers until about 8 weeks in age. In general, it is safe to allow kittens to separate from the mother cat at this specific age, but usually no younger than that. Social development has a hand in why kittens shouldn't be taken away from their mothers and litters at too young of an age. One of the most characteristic pastimes of kittens is rough play, essentially a type of aggressive play that involves a lot of pouncing, scratching, leaping, chasing and even biting. When kittens play tough, they learn "on the job" about how to use restraint during playtime. This helps kittens learn how not to bite or scratch painfully, for example. Kittens make observations based on how their litter mates react -- a valuable tool for the future. In fact, some kittens that are taken away from their mothers and litters too quickly have behavioral issues as adult cats. Apart from learning how to play safely, the presence of litter mates and the mother cat also helps kittens learn how to groom properly -- an absolute must in the feline world. The ASPCA notes that queen cats typically begin grooming their wee ones straight out of the womb. Also, when kitties reach about 5 weeks old, they usually start grooming their litter mates -- a social behavior that not only encourages cleanliness and hygiene, but also serves to solidify a positive connection and rapport between the furry siblings. Cats International: If You're Really Brave, Adopt a Kitten!